It has finally warmed up enough around here to let our new little chicken Kiwi stay outside--plus, she finally has all her feathers in. We are keeping her separate from the big hens for now because she is still too small to defend herself. But, once she gets bigger, we'll start integrating her into the flock. The other day, my husband said something like, "Who needs a puppy when you could have a chicken?" And he's right! When we take Kiwi outside with us, she follows us around like a little puppy. If you start to walk away from her, she'll squawk and chase you, wings flapping, until she catches up. While I hang laundry on the line, she contentedly pecks near my feet, pausing to look up at me hanging clothes occasionally, nipping at the ones that hang down low enough. If I am weeding in the garden, she is there next to me, seeing what I'm up to and trying to pull the weeds out of my hand. She really is very entertaining to have around. And it is entertaining to watch her try a new food. For instance, I had tried to give Kiwi worms in the past (our big hens just love worms), but she didn't quite know what to do with it. She'd just stare at it and halfheartedly peck at the squirming thing. Today, I decided to give it another try, and--success! She gobbled it up! 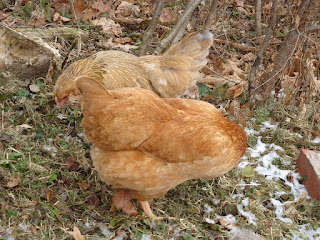 And just because, here are some recent pictures of our other three hens. 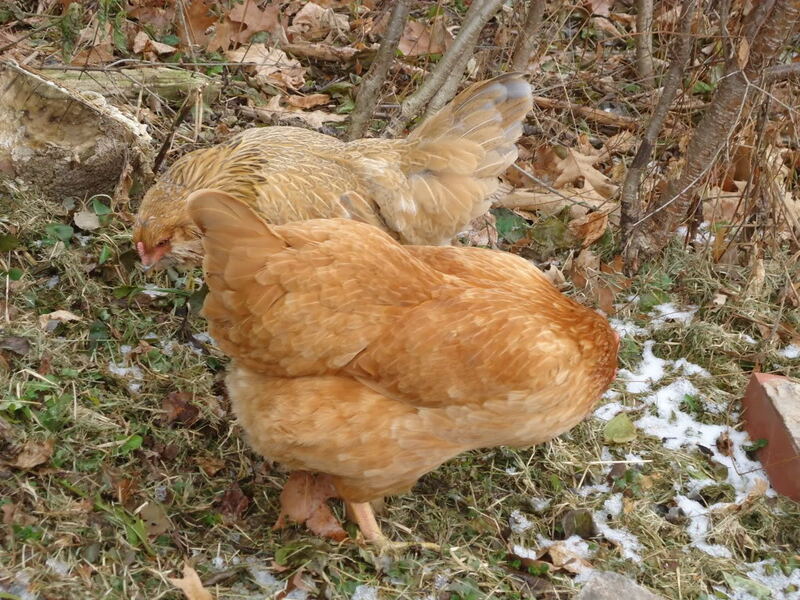 We have Polly (a New Hampshire Red), Big Mama, and Girlfriend (both sassy Ameraucana's). Girlfriend and Big Mama foraging.